Inbound Marketing is a necessary element of any marketing strategy. Unlike old-style marketing programs which require large investments to attract a small number of leads, Inbound Marketing delivers long-lasting, evergreen benefits for months and years to come. Needless to say, Inbound Marketing as described in this whitepaper can truly revitalize your marketing by delivering sustainable lead flow for any business. 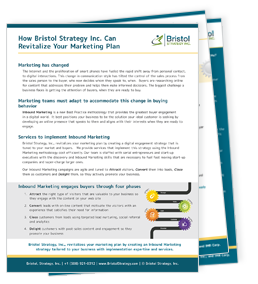 Revitalize Your Marketing Today! Download the white paper instantly.